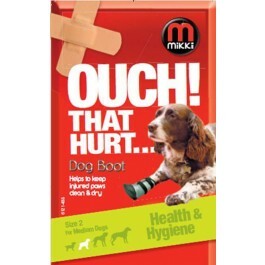 The Mikki Hygiene Dog Boot helps promote rapid healing of pad injury and guards against infection. The Mikki Dog Boot helps promote rapid healing of pad injury and guards against infection. Its bonded vinyl upper with a non-slip PVC sole makes it ideal for post-operation wear. Weatherproof materiel keeps dressing clean and dry. Reinforced non-slip sole for extra grip. Easy fit with elasticated support straps & Velcro fastening.